Ah sure it's summer time, or so we're meant to believe. That means we're out and about in the sunshine, getting a lovely golden glow on our faces.. snort, had you going there for a sec didn't I? Sigh.. The Irish summer.. The elusive dream... The closest thing that we get to a summer is the couple of weeks in June when the Junior and Leaving Certs are going on and it is always sunny. And the few days when the kids all go back to school in September. Thankfully I have this product to help me through the "summer". It's The Body Shop's Honey Bronze Bronzing Gel For Face (RRP €18). 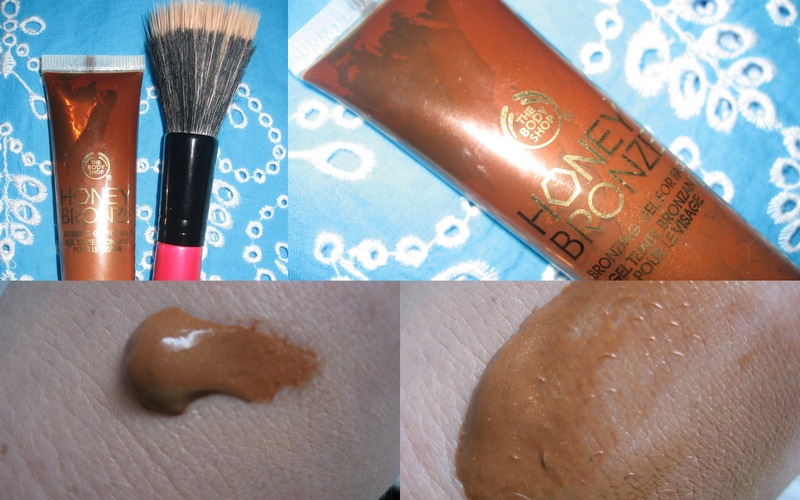 I got it at the launch of The Honey Bronze Collection back in April and it came with me to Spain on my girlie holiday. The Bronzing Gel For Face is a really lightweight moisturizing gel that you can apply to bare skin or over foundation to give a truly natural sun kissed glow. I am afraid of self tanners for the face because if you make a mistake with it, it ain't coming off and you're stuck with it for all the world to see! This is absolutely perfect for me. If I mess it up, I wash it off and start again, simple as that. The gel itself has a really strong honey scent. Funny that eh? It contains fair trade honey, beeswax and aloe vera. The first couple of times I used it, I found it really strange just because of that. I like honey on my porridge so I was cringing a bit applying it and was afraid bees would attack me. Thankfully the scent went away after a few minutes and no bees tried to chomp me. Now I can hardly smell the honey when I apply it so I'm getting used to it, so the moral of the story is, beware of the scent if you don't like honey. 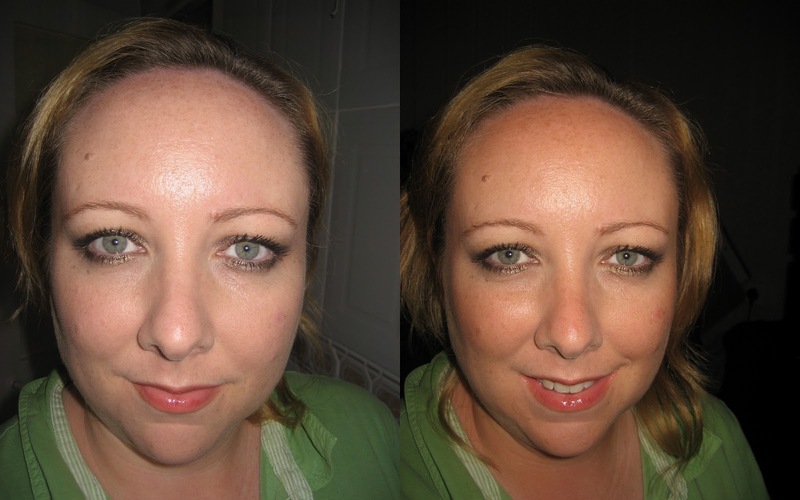 It looks scary on the skin initially but once blended in fully, you're left with a lovely natural and healthy glow. There's the teeniest bit of shimmer in it but once blended out, it can't be seen which makes me happy as I'm not a big fan of a lot of shimmer in bronzers. Here are some before and after pictures, excuse the hair! First up is without the flash. The fact that it's a gel means that the finished look is just more natural than if I had used a powder. It sinks into the skin beautifully and stays put. I used it in Spain when we were going out at night and that's when my real love affair set in with it. It didn't budge at all at all. When I had a tan on my face, it enhanced it and I didn't need to wear foundation underneath. When I apply it, I start on my forehead, I mean fivehead. I blend it into the hairline and fade it out towards my eyebrows. I then blend it over my cheeks, across my nose and onto the chin. So basically, anywhere that the sun would hit my face. 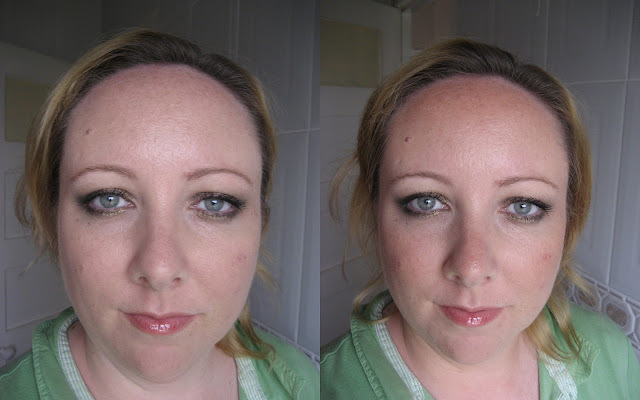 You can build up the layers to achieve a darker look which is what I like to do. I start off with a little bit and build up slowly. Above shows what it looks like with a flash photography. I am in love with this product and when I head back to Spain in September, it will be coming with me again. This weekend The Body Shop are finishing up their celebration of 30 years in Ireland and have 30% off everything in Irish shops so this is the perfect time to get this gorgeous product. I've been meaning to get this for aaages - would make sense to pick it up this weekend. Looks gorgeous on you! Had not heard of this but it looks awesome! Great post! This seems to be a good product! It looks great on you. That looks so fantastic and wasn't what I was expecting at all from a gel. Awesome post! Also, I refer to myself and 2 friends as the fourhead crew. Because between us we've got four foreheads! Brill post, it looks great on you. This looks great, I wear SPF 50 on my face so it's always a few shades lighter than the rest of me! Thanks for all the comments laydees! I love when I find a product I'm in love with, I can't wait to tell you all about it :) Let me know if any of you give it a go so I can be all smug and say "see, I toldya so"! This looks lovely! Pity I didn't get to the Body Shop over the weekend, ah well! 30% off everything in The Body Shop this weekend! I'm going on my holidays!